Annapolis Royal was the first permanent European settlement (established in 1605) in North America north of St. Augustine, Florida. 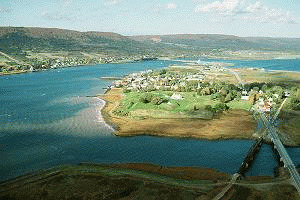 Until 1749 Annapolis Royal was the capital of the Colony of Nova Scotia. Today this town in the western part of Nova Scotia is home to almost 450 people. There are around 150 historic sites and heritage buildings in Annapolis Royal. At Port-Royal National Historic Site, costumed presenters help portray one of the oldest settlements in North America, complete with early 17th-century buildings. The Fort Anne National Historic Site offers 1797 British field officers' quarters and a terrific view of the Annapolis Basin. Another key site is the Annapolis Royal Historic Gardens, 17 acres of gardens showing the history and potential future of Nova Scotia gardens. The DeGannes-Cosby House, built in 1708, is the oldest wooden house in Canada. Among more modern attractions is Upper Clements Park, an entertainment park with 20 rides and attractions including roller coaster, water rides, miniature train and an antique auto ride, and summer entertainment. The Upper Clements Wildlife Park offers 30 acres of mostly North American mammals and birds. Nature enthusiasts will enjoy hiking and birdwatching at Delap's Cove Wilderness Trail on the Bay of Fundy's shores. For a modern marvel, stop to look at the Annapolis Tidal Generating Station, North America's first and only modern tidal power plant.